I’m excited to be heading to the University of Alabama on March 1, 2018, to discuss the movie, The Free State of Jones, as well as my book, The Free State of Jones: Mississippi’s Longest Civil War ! The “Movie Edition” of my book, pictured here, was released in January 2016 by the University of North Carolina Press and features a new epilogue and timeline of events. Noted Civil War historian Dr. Victoria Bynum will host a screening of the 2016 film, The Free State of Jones, staring Matthew McConaughey, which was based upon her 2001 work, The Free State of Jones: Mississippi’s Longest Civil War, with a discussion of the film and the real-life events to follow. The screening will take place in 205 Gorgas Library on March 1, 2018, at 3:30 PM. Sponsored by the Charles G. Summersell Chair of Southern History and the College of Arts and Sciences. For more information, contact Dr. Lesley Gordon or the Department of History (205-348-7100). amazing when we realize that such uprisings occurred throughout the Civil War South. As demonstrated throughout this blog, histories of Southern Unionism and dissent reveal both class conflict and interracial collaboration in the Civil War era South. The history of Southern guerrillas and Unionists has long been twisted, denied, or buried by pro-Confederate historians and novelists and Neo-Confederate activists who seek to deny what was the true cause of Southern secession: the defense and protection of the institution of slavery. The mania of Confederate-monument building that occurred in the early twentieth century literally carved this pro-Confederate “Lost Cause” version of history into stone. Simultaneously, guerrilla leaders such as Jones County’s Newt Knight and Jasper Collins were described as degraded poor white “hillbillies” guilty of treason. In fact, they and others were articulate, land-owning farmers who defended the Union against what they considered the treasonous Confederate government. If this topic intrigues you, my 2010 collection of historical essays, The Long Shadow of the Civil War: Southern Dissent and Its Legacies, expands the story of Southern dissent into the twentieth century. Topics include Newt Knight’s post-Civil War actions, the fate of the Knight interracial community, Jasper Collins’s embrace of the populist “People’s Party” and his rejection of the Baptist Church for the Universalist faith, the Unionist uprising led by Jasper’s brother, Warren J. Collins, in the Big Thicket of East Texas, and the men and women who fought for the Union in the inner civil wars of the Randolph County area of North Carolina. My work on Warren J. Collins, whose Unionism led him to run for political office as a Socialist in the twentieth century, is expanded and placed in a Texas context in Lone Star Unionism, a pioneering collection of essays edited by Jesus F. de la Teja, and published in 2016. The History Department was honored to host noted Civil War historian, Dr. Victoria Bynum, for a pair of departmental events this March. 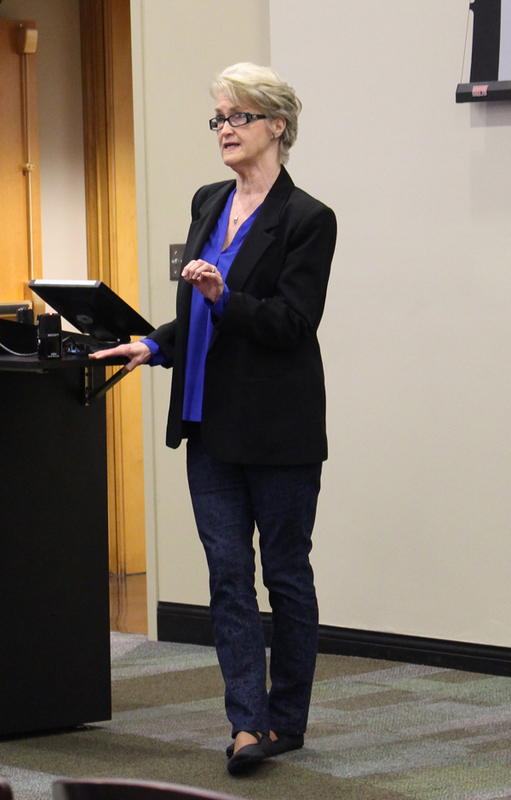 The Department hosted a screening of the 2016 film The Free State of Jones, based on her 2001 work The Free State of Jones: Mississippi’s Longest Civil War. Following the screening was a Q&A discussion with Dr. Bynum, as she examined the film’s strengths and weaknesses as an adaptation of her research, as well as provided more information on the real-life events in Jones County. The following day, Dr. Bynum joined us again for an informal breakfast talk with faculty and graduate students. Dr. Bynum elaborated on the process of having a work of research turned into a film, and discussed her own education and career path, as well as current events and present trends in historical scholarship. Thank you so much to Dr. Bynum for visiting the Department! And thank you to Dr. Lesley Gordon, Summersell Chair, for arranging this visit. Do you make it back to Missouri? I live in Springfield Missouri and recently finished your book Free State of Jones and viewedthe movie Free State of Jones and I am a descendant of Martha Knight from Laflore County Mississippi I recently sent you a note on Facebook about my relative and would like continue my research on my family history. I appreciate any help or assistance in doing this .Thank you and thank you for the very informative book. No, I don’t go back to Missouri much since moving back to Texas. I’m pleased that you read my book and found it informative. In regard to your ancestor Martha Knight, do you have any indication that she is descended from the Jones County Knights? Knight is a pretty common name, so you would have to give me much more evidence of her lineage for me to make an educated guess. I’m not a professional genealogist, btw, but rather a historian who uses genealogy in my work. Am happy to help, however.